Yay! I Won in Thunderbird Resorts Promo - This is an update on the last promo of Thunderbird Resorts in their Facebook page and my efforts paid off because I won Free Day Tour for Two at Thunderbird Resorts Rizal plus 1yr Sidetrip Magazine Subscription. Thanks Thunderbird Resorts! 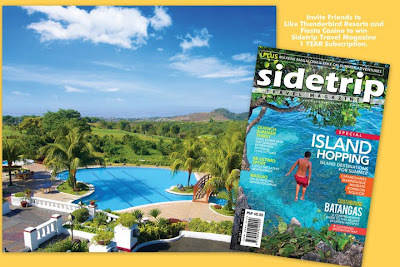 For his campaign efforts and support to Thunderbird Resorts promos, Thuderbird arwards the Overnight Stay for two at Thunderbird Resorts Rizal plus 1yr Sidetrip Magazine Subscription to Resly George Amador. Congratulations! One year Sidetrip Magazine Subscription goes to the chosen contest participants and active followers of Thunderbird Resorts and Fiesta Casino. The Thuderbird promo result is posted at their Thunderbird Resorts Blog.